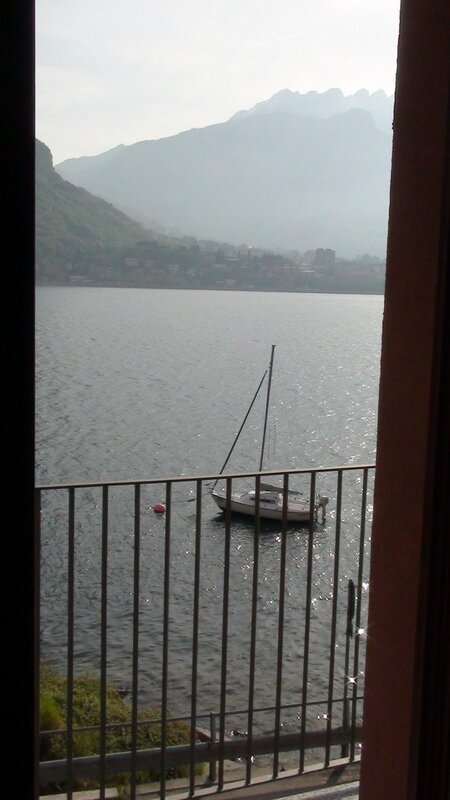 Looking over Lake Como from our room at the Bellavista in Valmedrera at the town of Lecco in the distance, where my filmmaker friend Ilaria lives. Lynne says the bell tower is typical Lombardy. 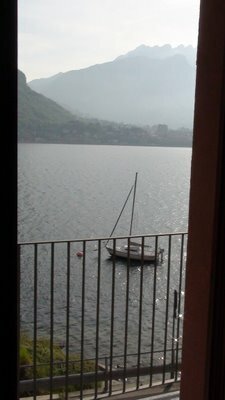 Bellagio, the real one, is just north of here, famous in my circles for the Rockefeller study center. Ron Kuivila told us that his residency there consisted of one unbroken cocktail hour. The hoteliers speak Western Lombard, not sure which dialect. Tomorrow we take the trip over the alps in the opposite direction of Hannibal, sans war elephants, but with pillaging, conquest and victory on my mind at least, into the land of Schweizerdeutsch. According to the map accompanying this Italian Wikipedia article (link), it looks like it might be Brianzolo (link). A dictionary (online) may provide help in your efforts to get slapped in the faccia. I take that back. It's probably a kind of Comasco-Lecchese (link). I never did get my map-reading merit badge. Thanks Herr Bissus. I knew I was leaving a bit of a honeypot set to ensnare you (pardon the mixed metaphors).